The rhythm of life is dictated by water and Hindus hold rivers in great reverence. India is a country that not only nurtures the resources nature has bestowed upon her, but also worships them for the all-round prosperity they bring in their wake. Rivers are one such gift which are considered highly sacred throughout the length and breadth of the country. This is primarily because these mighty rivers have perennially been a source of livelihood to millions of people living in areas lying along their courses. No wonder people see in them a manifestation of divine female power (shakti). "Ambitame, naditame, devitame, Sarasvati"- "O best of mothers, O best of rivers, O best of goddesses, Sarasvati"
About 4,500 years ago the Sarasvati was eulogized thus in the Rig Veda. "The Ganga is a living symbol of an ancient culture's way of life and of the sacred dimension of nature itself. The whole Hindu world still comes to her banks, to sing, to pray, to wash, to ask favors and blessings, to barter, to die." "The Ganga is India’s ecological, economic, cultural and spiritual lifeline." Hindus have always believed that water from India 's Ganges River has extraordinary powers and prevents disease. The Indian emperor Akbar called it the "water of immortality" and always traveled with a supply. The British East India Co. used only Ganges water on its ships during the three-month journey back to England , because it stayed "sweet and fresh." The rivers are generally female divinities, food and life bestowing mothers. As such, they are prominent among the popular divinities represented in the works of art of the classical period. The most holy of rivers, the best known and most honored, is the Ganga or Ganges. She is personified as Goddess Ganga. The sacred river Ganga not only provides water for the land; the water is itself the symbol of life without end. The river rises from an ice bed, 13,800 feet above the sea level in the Garhwal Himalayas. Devotees traverse long distances to partake and procure the "Gangajal" (water of Ganga), as it is almost thought to be divine. Because the Gangajal procured from the "Har ki Pauri" in Hardwar perennially remains fresh! In mythology, Ganga is depicted as a beautiful young woman, holding a lotus in one hand, cascading down the tresses of Lord Shiva The story of Goddess Ganga is one of the most important themes in Indian mythology which has inspired the artists and sculptors. The doorway of every temple in India is guarded by an anthropomorphic representation of river Ganga. “In the scriptures a realization is there that if all the waters which descend upon the mountain were to beat down upon the naked earth would never bear the torrents… In Shiva’s hair we have a very well-known physical device which breaks the force of the water coming down… the vegetation of the mountains”. The ancient city of Allahabad (formerly known as Prayag) lies at the confluence of the Ganga (Ganges) and the Yamuna, two sacred rivers that have been cradles of the Indian civilisation. The city is mentioned in the oldest Indian literature such as the Vedas, Ramayana, Mahabharata and the Puranas. According to Hindu tales, Lord Brahma, the creator chose a place where three of the holiest rivers on earth could meet in harmony. The city is also referred to as `Tirth Raj' or the `king of pilgrimage centers'. "The Ganga is a living presence, a protector, a healer of ills. The Ganga is as alive as it ever was with the hopes and dreams of an entire culture. Even Jawaharlal Nehru, that arch-modernists, asked that his ashes be cast into the Ganga at Prayag. "I am proud of this noble heritage which was and still is ours, and I am aware that I too, like all of us, am a link in that uninterrupted chain which finds its origin in the dawn of history, in India's immemorial past. It is in testimony of this and as a last homage to the cultural heritage of India that I request that a handful of my ashes be thrown in the Ganga at Allahabad, so that they may be borne to the vast ocean that bears on the shores of India." Kashi is the holiest place for Hindus. It is considered holier than the sky. It is at Kashi that Count Keyserling describes the ecstasy that Hindu devotion means. "The whole Hindu world still comes to her banks, to sing, to pray, to wash, to ask favors and blessings, to barter, to die. The Ganga is a living symbol of an ancient culture's way of life and of the sacred dimension of nature itself. Of all the goddesses, Ma Ganga, is the only one without a shadow. She is the unequivocal fountain of mercy and compassion, here in this world only to comfort her children. Her waters are the milk, the nectar of immortality, source of all life, and abundance. Countless flowers are strewn across her body daily; millions of lights set sail every evening upon her waters. While stories of gods and goddesses come and go with the ages, while stories replaces or rivals another, the organic presence of Ganga continues as ever, absorbing her devotees' offerings and ashes in the same way she has done since time immemorial." (source: Travel Through Sacred India - By Roger Housden p. 22-23). Of particular sanctity in India are the perennial rivers, among which the Ganga stands first. This river, personified as a goddess, originally flowed only in heaven until she was brought down by Bhagiratha to purify the ashes of his ancestors. She came down reluctantly, cascading first on the head of Siva, in order to break her fall, which would have shattered the Earth. Confluences are particularly holy, and the Gangas' confluence with the Yamuna at Allahabad is the most sacred spot in India. Another river of importance is the Saraswati, which loses itself in desert; it was personified as a goddess of eloquence and learning. Kumbh Mela: The magic of the mystical Ganga. According to devotees, those who come to the river with a prayer, never leave back unsatisfied. Faith in the power of the river, to heal, to resurrect the dead from the grave. The recent Mahakumbh at Tirthanagari Prayag, has witnessed a mind boggling rush among people, both Indian and foreign, to take a dip in the water of the river, whose origin is as deep as the Himalayas themselves. "Ganga Maiyya (Mother Ganga) will take care of us," The belief among the devotees, startles many first timers to this mela. The sheer scale of the Kumbh mela is so mind-boggling. "when the water of the Ganges and the water of the Yamuna mingle, it appears as though diamonds and sapphires were woven together in a string; as though a flock of white swans had suddenly run into another flock of black swans; as though a garland of white lotus buds were interspersed with blue lotuses; as though streaks of lightning had merged into a sheet of darkness; as though a clear blue sky was spotted with wooly clouds of autumn." (source: Kumbha Mela - By By Jack Hebner and David Osborn p. 34). 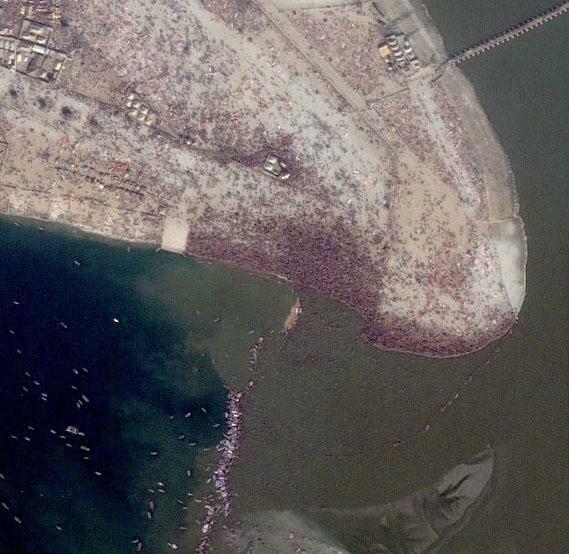 Collected on January 23, 2001, this one-meter resolution satellite image shows the start of the Maha Kumbh Mela's busiest bathing day. Masses of people are visible bathing in the river, and the shape of the river bank has changed. It's extraordinary to witness this sort of mass spiritual communion between so many people and the river. The varied images from Kumbh attracts everyone from Boston to Benaras.'' -- the biggest spiritual event in the globe. Bishambhar Bhushan, poor and blind, traveled two days in a cramped train from his village of Dhanvani in central Madhya Pradesh state. Bhushan, 80, scooped up the cold river with his hands, and offered it to the heavens in a centuries-old gesture. "I told Mother Ganga, take me across life, mother," he said, his eyelids twitching with excitement. "My life's ambition is fulfilled." Together, the Kalpavasis and the Sanyasis, provide a glimpse into the spiritual mindset of the people of India set in their pursuit of salvation. Kalpavasis, are people who survive on minimal food and clothing, and whose number runs into tens of thousands. They sleep in the open during the freezing winter nights on the river banks, revealing the spirit of the Kumbh as much as the sadhus who come in hoards with their respective flag-bearers. In perhaps one of the largest gatherings ever, millions of pilgrims took a dip at the seven ghats at Sangam - the confluence of the Ganga and the Yamuna - on Wednesday, stretching the administration and the police to their limits, but reinforcing the fact the Indian milieu had not lost touch with the divine. In his moving novel, Deep River, Shusaku Endo (1923-1996) a major Japanese author writes about a group of Japanese tourists, each of whom is wrestling with his or her own demons, travels to the River Ganga on a pilgrimage of grace. Each has come to India and the holy river Ganga on a spiritual quest, and each discovers that God has "many faces." (For more on Kumbh mela please refer to the Glimpses chapter). such are the countries and regions deprived of the Beneficial virtues of the Ganga. thus undoubtedly are the countries and regions that the Ganga does not bathe. - such are the virtues of the Ganga celebrated in the Mahabharata. Hindus have always believed that water from India 's Ganges River has extraordinary powers and prevents disease. The Indian emperor Akbar called it the "water of immortality" and always traveled with a supply. The British East India Co. used only Ganges water on its ships during the three-month journey back to England , because it stayed "sweet and fresh." In most rivers, organic material usually exhausts a river's available oxygen and starts putrefying. But in the Ganga , an unknown substance, or "X factor" that Hindus refer to as a "disinfectant," acts on organic materials and bacteria and kills them. The Gangas' self-purifying quality leads to oxygen levels 25 times higher than any other river in the world. Yet no one can explain why only this river alone has this extraordinary ability to retain oxygen. (source: Mystery Factor Gives Ganges a Clean Reputation - npr.org). Kumbha Mela, is considered an event with an unpronounceable name that took place in a city that is as unknown to the West as the festival itself, and in a country that is thought to have little impact on world events – India . Never mind that this year’s Mela brought thirty million pilgrims, young and old alike, to commune for forty-one days in an expression of divinity that is steeped in tradition and based on unparalleled philosophy. In the words of Schopenhauer, “There is no religion or philosophy so sublime and elevating as Vedanta.” As Eurocentrism is becoming identified with ignorance and oppression, Asia ’s emergence as the true center of culture and civilization seems inevitable. Events like Kumbha Mela will take their seat with dignity they are due, and the world may come to know an unprecedented era of spiritual upliftment, without which the future is rather bleak. Americans experiencing a spiritual and cultural event of ancient India in the 20th century – literally getting their feet wet – is but another sign of death for “the Ugly American” and the birth of “the Humble American” – a new breed indeed. Kumbha Mela is internationally famous as the earth’s largest gathering of human beings. Through out the 20th century, Western civilization has marveled at the Kumbh Mela. Sensationalistic and inaccurate journalism – reports of “millions of ignorant people bathing in the filthy water of the Ganges ,” “worshipping pagan gods and performing mysterious sacrifices” – has given the Western world something less than a noble appreciation of the Kumbh Mela. Thus few Westerners have taken the time to attend a Kumbha Mela or to understand the esoteric meaning of this poignant event. There is something about the Kumbha Mela, however, that captivates the Western mind. Some people say the reaction to the Kumbha Mela is so strong because Kumbha Mela represents the opposite to Western culture. Others say that the Kumbha Mela beckons the very soul of our existence, calling our higher self to shake off attachments to worldly life and step toward eternity. Kumbha Mela represents all that is India , past and present. 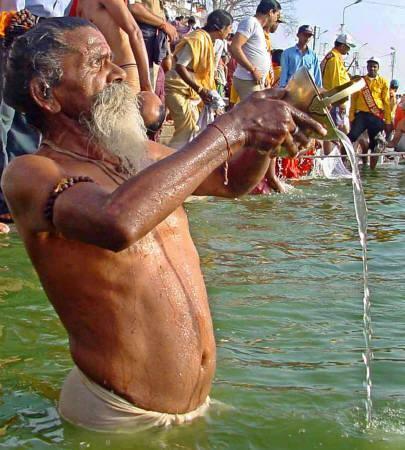 Kumbha Mela has gained international fame as “the world’s largest act of faith. Pilgrims attend this holy event with such tremendous faith and in such overwhelming numbers that it could appear quite bewildering to one who is experiencing it for the first time. Faith in the transcendent is something the modern mind tends to reject. Being partial to rational and scientific thought, we may mistake faith for sentiment or even ignorance. However, the faith demonstrated at the Kumbha Mela cannot so easily be dismissed. There, faith is as substantial as the ground upon which the pilgrims stand. Faith, in the sense of divine experience, has been described as "unflinching trust in something sublime." According to the sages of India, there is an infinite, transcendental world or conscious perception, in which doubt is absent - a world guided by faith. That infinite plane of existence is obtained by an evolution in consciousness, and faith alone can lead one in the attempt. (source: Kumbha Mela - By Jack Hebner and David Osborn p. 1 - 56). To enjoy the bright sun. And by their proper use become wiser. I seek the Lord of the Waters of golden appearance. May he hear our entreaty and grant us a place of ablution. Whatever food I have taken in the house of the wicked, whatever gift I have received at the hands of the crafty, whatever sin of thought or word or deed I have committed, from this may Indira, Varuna, Brhaspati and Surya cleanse me again and again. I have eaten or drunk to excess, or consorted with people of violent ways, may king Varuna wipe it all away. Thus, rid of impurity and evil and free from my sin, may I find liberation and pass to the world of the Lord of creation. River Ganga, as it is known to most Indians, is a living icon of the Hindu religion. The Hindu scriptures say King Bhagirathi prayed to the god Shiva in penance at Gangotri and was rewarded with the goddess Ganga, delivered in the form of a river. Because the river would have devastated the area if it had fallen freely to earth, Shiva caught it in the locks of his matted hair, permitting a gentle descent. King Bhagirathi's prayer rock is preserved in a small temple alongside the river. The main temple, built in the 1700s, lies a few hundred yards away. Gangotri is an important pilgrimage for Hindus, and thousands come here every year. In April Gangotri is the site for a major celebration of Ganga. That celebration focuses on the return to the Gangotri temple of the small figurine that represents the goddess Ganga. Since snow makes Gangotri inaccessible for nearly six months each year, the "deity" is kept in winter in a similar temple in Mukhuwa, a village in the valley below Gangotri. The deity is brought up the mountain each spring in a colorful procession led by the blowing of horns. (source: Journeying to the Source of Ganga - By Neal Jackson - npr.org). 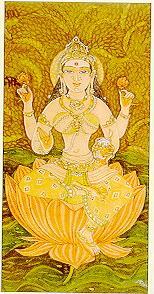 Goddess Saraswati known as Ben-ten in Japan. Goddess Saraswati is the embodiment of the mighty Saraswati River of the Vedas. Not far from the foot of the peak itself, at nearly 15,000 feet above sea level, reflecting the light of its snows, repose the calm blue waters of the most sacred lake of Hindu religion and stories -holy Lake Manasarovar, "Lake of the Mind." The hardiest of Hindu pilgrims aspire to take the long and dangerous journey over high passes to bathe in Manasarovar's icy waters and cleanse their minds of the sins that threaten to condemn them to the suffering of rebirth. Goddess Saraswati is the embodiment of the mighty Saraswati River of the Vedas. Saraswati means "the essence of one's own self." The Sanskrit word 'sara' means essence and 'swa' means 'self'. She is the earliest goddess who is associated with a river in the Indian tradition. She is the divine spouse of Lord Brahma, the creator. Since knowledge is necessary for creation, Saraswati symbolizes the creative power of Lord Brahma. She is also praised for her ability both to cleanse and fertilize the earth, and has been equated with the goddess of learning, poetry, music, and culture. 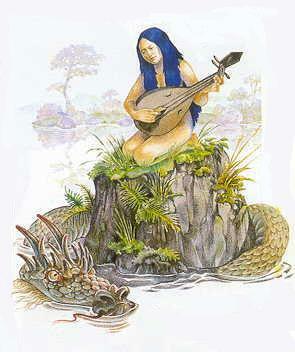 She is associated with speech- Vac: the goddess of riverlike, streaming speech. Saraswati is typically shown seated on a lotus. Like the swan, the lotus seat of the goddess suggests her transcendence of the physical world. She floats above the muddy imperfections of the physical world, unsullied, pure, beautiful. Although rooted in the mud (like man rooted in the physical world), the lotus perfects itself in a blossom that has transcended the mud. She inspires people to live in such a way that they may transcend their physical limitations through the ongoing creation of culture. Goddess Saraswati is worshiped throughout India and on her special day in spring, Vasant Panchmi, she is worshipped by school children as the patron goddess of learning. The Benaras Hindu University was also founded on this day. Brahmputra is the mighty river that dominates the landscape of north-east India. Emanating from the Mansarovar region in the Himalayas, it incessantly gushes down with a massive force through the dense forests of north-eastern states of India, particularly Assam. Brahmputra may not be revered as much as the Ganga is, but she is considered to be more beautiful. Despite its masculine-sounding name, Brahmputra is essentially feminine and exceeds Ganga by a good 450 kilometers in length. The most unique feature of this great river is its navigability at an astounding altitude of ten thousand feet! Like the Ganga, its waters too are snow-fed and are generously rainfed, thus making it flow throughout the year. The Saraswati, Ganga, Yamuna, Brahmaputra, Krishna, Kaveri, and other rivers represent an ever-flowing stream of celestial grace which purifies and fertilizes the earth. Note: Hindu leaders have long been among the most outspoken defenders of natures balance. For the Hindu, nature is sacred, to be respected and cared for. The last few weeks saw a growing momentum worldwide for initiatives that gather religious leaders to discuss climate change's causes, consequences and possible solutions. INDIA, November 4, 2009: The Himalayan glaciers are the largest body of ice outside the polar caps, and they are under threat from global warming. The warning comes from experts, among them Dr. R K Pachauri, head of the UN’s Intergovernamental Panel on Climate Change and Nobel Peace Prize laureate of 2008. (source: news.bbc.co.uk and The Sacred Ganges , Threatened by Climate Change - hinduismtoday.com).